Download "CURRENTLY, the enterprise data centers manage PB or"
1 IEEE TRANSACTIONS ON CLOUD COMPUTING, VOL. 61, NO. 11, JANUARY 21 1 : Distributed Deduplication for Big Storage in the Cloud Shengmei Luo, Guangyan Zhang, Chengwen Wu, Samee U. Khan, Senior Member, IEEE, and Keqin Li, Fellow, IEEE Abstract As data progressively grows within data centers, the cloud storage systems continuously face challenges in saving storage capacity and providing capabilities necessary to move big data within an acceptable time frame. 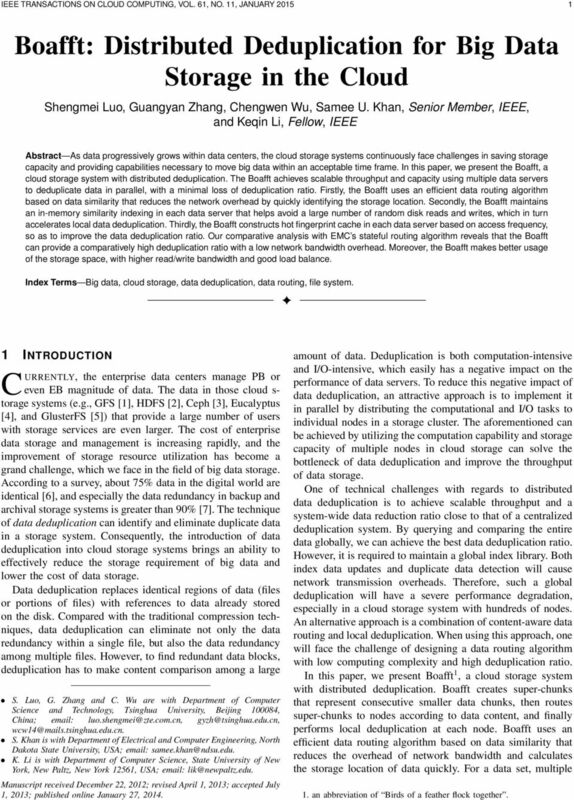 In this paper, we present the, a cloud storage system with distributed deduplication. The achieves scalable throughput and capacity using multiple data servers to deduplicate data in parallel, with a minimal loss of deduplication ratio. Firstly, the uses an efficient data routing algorithm based on data similarity that reduces the network overhead by quickly identifying the storage location. Secondly, the maintains an in-memory similarity indexing in each data server that helps avoid a large number of random disk reads and writes, which in turn accelerates local data deduplication. Thirdly, the constructs hot fingerprint cache in each data server based on access frequency, so as to improve the data deduplication ratio. Our comparative analysis with EMC s stateful routing algorithm reveals that the can provide a comparatively high deduplication ratio with a low network bandwidth overhead. Moreover, the makes better usage of the storage space, with higher read/write bandwidth and good load balance. Index Terms Big data, cloud storage, data deduplication, data routing, file system. 1 INTRODUCTION CURRENTLY, the enterprise data centers manage PB or even EB magnitude of data. The data in those cloud s- torage systems (e.g., GFS , HDFS , Ceph , Eucalyptus , and GlusterFS ) that provide a large number of users with storage services are even larger. The cost of enterprise data storage and management is increasing rapidly, and the improvement of storage resource utilization has become a grand challenge, which we face in the field of big data storage. According to a survey, about 7% data in the digital world are identical , and especially the data redundancy in backup and archival storage systems is greater than 9% . The technique of data deduplication can identify and eliminate duplicate data in a storage system. Consequently, the introduction of data deduplication into cloud storage systems brings an ability to effectively reduce the storage requirement of big data and lower the cost of data storage. deduplication replaces identical regions of data (files or portions of files) with references to data already stored on the disk. Compared with the traditional compression techniques, data deduplication can eliminate not only the data redundancy within a single file, but also the data redundancy among multiple files. 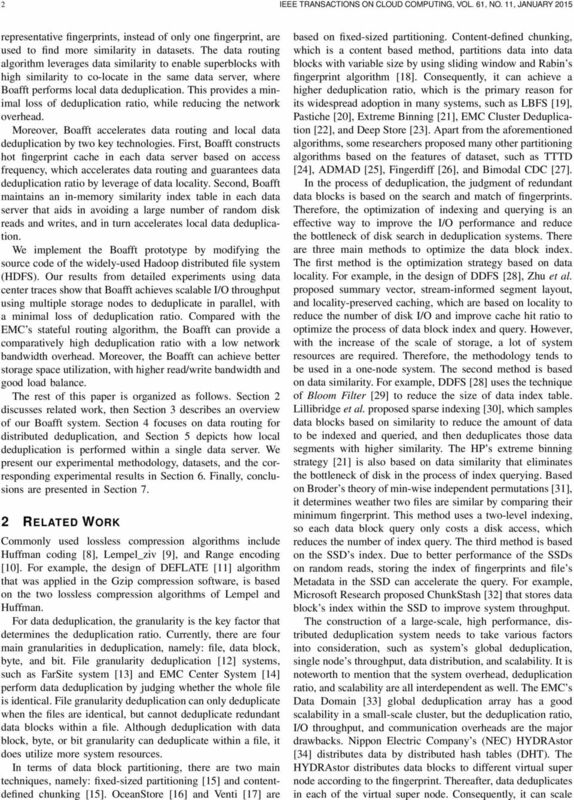 However, to find redundant data blocks, deduplication has to make content comparison among a large S. Luo, G. Zhang and C. Wu are with Department of Computer Science and Technology, Tsinghua University, Beijing 84, China; S. Khan is with Department of Electrical and Computer Engineering, North Dakota State University, USA; K. Li is with Department of Computer Science, State University of New York, New Paltz, New York 1261, USA; Manuscript received December 22, 212; revised April 1, 213; accepted July 1, 213; published online January 27, 214. amount of data. Deduplication is both computation-intensive and I/O-intensive, which easily has a negative impact on the performance of data servers. To reduce this negative impact of data deduplication, an attractive approach is to implement it in parallel by distributing the computational and I/O tasks to individual nodes in a storage cluster. The aforementioned can be achieved by utilizing the computation capability and storage capacity of multiple nodes in cloud storage can solve the bottleneck of data deduplication and improve the throughput of data storage. One of technical challenges with regards to distributed data deduplication is to achieve scalable throughput and a system-wide data reduction ratio close to that of a centralized deduplication system. By querying and comparing the entire data globally, we can achieve the best data deduplication ratio. However, it is required to maintain a global index library. Both index data updates and duplicate data detection will cause network transmission overheads. Therefore, such a global deduplication will have a severe performance degradation, especially in a cloud storage system with hundreds of nodes. An alternative approach is a combination of content-aware data routing and local deduplication. When using this approach, one will face the challenge of designing a data routing algorithm with low computing complexity and high deduplication ratio. 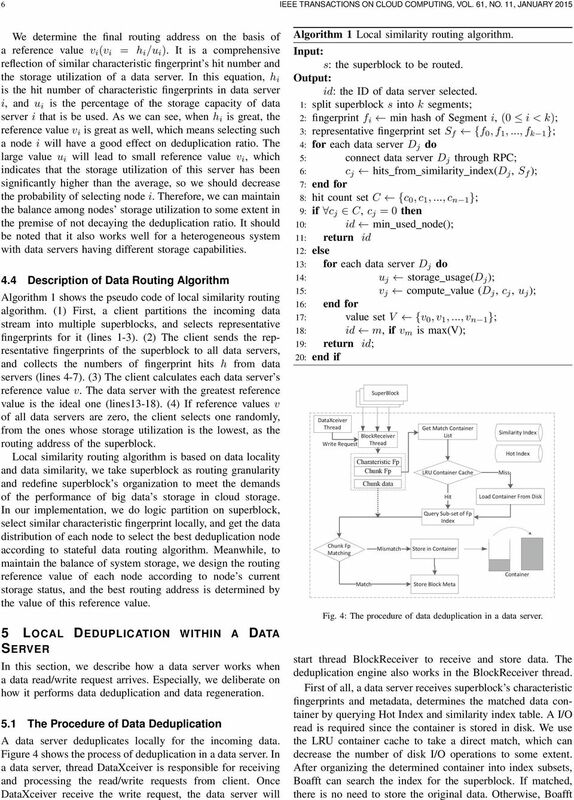 In this paper, we present 1, a cloud storage system with distributed deduplication. creates super-chunks that represent consecutive smaller data chunks, then routes super-chunks to nodes according to data content, and finally performs local deduplication at each node. uses an efficient data routing algorithm based on data similarity that reduces the overhead of network bandwidth and calculates the storage location of data quickly. For a data set, multiple 1. an abbreviation of Birds of a feather flock together. 5 LUO ET AL. 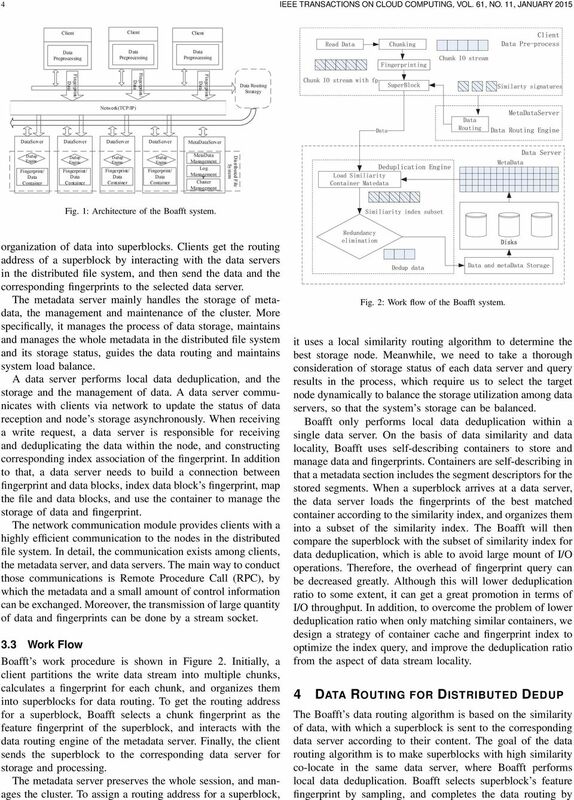 : BOAFFT: DISTRIBUTED DEDUPLICATION FOR BIG DATA STORAGE IN THE CLOUD using stateful routing. In this manner, the improvement of deduplciation ratio can be achieved, while the performance of the storage cluster can be guaranteed. IO Stream SuperBlock s Logical Partitions Segment Segment Segment Segment 4.1 Routing Granularity A granularity of data routing determines a tradeoff between throughput and capacity reduction ratio. Taking small chunk as routing granularity can improve the deduplication ratio but will decrease overall system throughput. While taking a file as routing granularity will make a great decrease in deduplication ration, and will cause imbalance of data distribution among data servers. takes superblock as its basic unit of data routing. When uploading a file, uses a partitioning algorithm to divide a file into many small chunks. A superblock is made up of a number of continuous chunks. In this way, a file is splitted into some continuous superblocks, and then take superblock as a basic routing unit, which is sent to the selected data server to deduplicate. 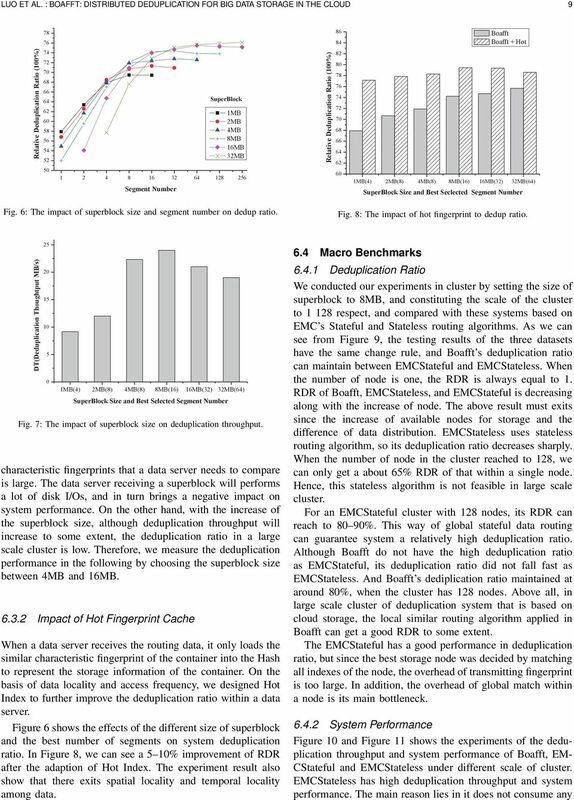 The selection of the superblock size is the key factor that affects deduplicaiotn ratio and system performance. Through the experiments on actual datasets, we found that when the superblock size varies between 4M and 16M, the write efficiency of data stream and the system throughput can be improved, while the deduplication ratio of system can be ensured as well. Refer to the section of experimental evaluation for more details. Moreover, taking a superblock as the granularity of data routing will partition a data stream into some superblocks that will be sent to different data servers, by which we can utilize computing resources of a cluster efficiently and satisfy the applications demands of parallel processing on big data in the cloud storage system. Besides, it can keep the data locality, improve the performance of read/write, reduce the overhead of network communication, and avoide the problem of data distribution skew when routing a whole file. Besides, we can achieve good deduplication ratio. 4.2 Choosing Feature Fingerprint In the process of data routing, we assume the incoming data streams have been divided into chunks with a content-based chunking algorithm, and the fingerprint has been computed to identify each chunk uniquely. The main task of data routing is to quickly determine the target data server where an incoming chunk can be deduplicated efficiently. Sending all chunk fingerprints to all data servers for matching will cause huge network overhead. Moreover, it is unrealistic to load all fingerprints into memory in a data server, which will cause a large amount of disk I/Os, and degrading system performance severely. The takes feature fingerprints for data routing, which was sampled from the data to be routed. Therefore, the uses similarity matching instead of globally exact matching. The process of selecting a feature fingerprint for a superblock is shown in Figure 3. The divides a superblock into multiple segments based on the principle of fixed size or equal number of chunks. Every segment was composed by some continuous chunks, and the segment is taken as a unit when selecting a representative fingerprint. According Selecting segment s representative Fp (min-hash) SuperBlock s Characteristic Fp set Fig. 3: The procedure of choosing feature fingerprint for a superblock. to the Broder s theory , selects the Min-Hash as the representative fingerprint of the segment. After the completion of the sampling of all segments in a superblock, the organizes the selected representative fingerprints of all segments into a characteristic set, and takes the set as the feature fingerprint of the superblock. The EMC s Cluster Deduplication determines the routing path by adopting simple stateless routing or global search, and system deduplication ratio and throughput will be best when the superblock size is 1MB. However, in cloud storage environments, for these online compression and deduplication systems, forwarding small data blocks consumes a large amount of network resources, and in turn increases systems response time and lowers I/O throughput seriously. Therefore, we redefine the size of a superblock, and sample according to the similarity-based theory to ensure highly efficient deduplication within the data server and satisfy cloud storage s fast response requirement better. 4.3 Stateful Routing uses the stateful routing algorithm based on data similarity. When storing a data superblock, sends the feature fingerprint of this superblock to every data server, gets the similarity values of the superblock with the data stored in each data server, and chooses the best matched data server according to similarity values and storage utilization of data servers. Consequently, can ensure comparatively high deduplication ratio and achieve load balance among data servers. Each data server maintains a similarity index table, which is used to store the characteristic fingerprints of the superblocks in data containers. When storing a superblock in an open container, the characteristic fingerprint of that superblock will be loaded into similarity index as the container s representative characteristic fingerprint. The similarity index can be loaded into memory. A client sends a superblock s characteristic fingerprint to all data servers. Each data server compares the received fingerprint with the similarity index table in memory to get the hit number of the characteristic fingerprints. According to Border theory, the equal Min-Hash of two sets means that the two sets have high similarity. Therefore, a superblock s hit number in a data server represents that the value of similarity the superblock with the corresponding data server. If the hit number in a data server is large, we believe that the data stored in the node have a high similarity with the superblock. 7 LUO ET AL. : BOAFFT: DISTRIBUTED DEDUPLICATION FOR BIG DATA STORAGE IN THE CLOUD 7 Xceiver thread Block Meta Chunk_1 meta Read request Block Meta location Chunk_2 meta SuperBlock_ SuperBlock_ SuperBlock_ BlockSender thread Load Block Meta Chunk_m meta SuperBlock data reorganization Disk data read according to Block Meta metadata. Finally, BlockSender sends the reorganized superblock to the client. When a data server performs local read operations, if the chunk to be read next is not the data but the address of the data, it will cause random disk read. That is, the read of a chunk will across some files. To eliminate the bottleneck of random disk reads, performs data deduplication only among some similar containers. In this way, there will be not too many I/O operations and will not open many files for data reorganization, which will decrease the possibility of random reads greatly. CID Hash Logic-offset Physic-offset length Containers Fig. : The procedure of data reorganization in a data server. selects an open container to store the remaining data. Finally, writes every chunk s storage information into the disk. After deduplicating all the chunks in a superblock, then writes the remained data into the container at once. Compared with the method of writing deduplicated chunk one by one, it can reduce the number of I/O operations and improve the data server throughput when receiving data. Another important aspect is the maintenance of index in the process of deduplication. Index update can be divided into three parts: Update of index in cache, the update of LRU container cache is based on data server s read/write requests and the update of cache is in a way of LRU. Update of similarity index table, after storing the container, we need select a characteristic fingerprint from superblocks in the container, and update it to the similarity index table for the later use of querying and matching of similar fingerprint. Update of Hot Index table, we update the Hot Index according to the access frequency of chunk s fingerprint, and the chunk stored in a container of the LRU container cache..2 The Procedure of Reorganization When reading a file, a client sends a request to the metadata server for the file metadata. Then, the metadata server returns the data server address of the superblock and the superblock ID to the client. The client establishes a connection with the data server, by which the client reads the corresponding superblock. To handle the read request from a client, a data server reorganizes the data content of the superblock, and returns the whole data to the client. Figure shows the process of superblock reorganization in data server. When the Xceiver thread receives read requests, the system starts the BlockSender thread, which reads and sends the requested superblock. In more detail, Block- Sender first positions the physical address of the superblock metadata, and loads the superblock metadata. BlockSender then reorganizes the superblock according to the superblock.3 Updating Hot Index On the basis of LRU cache, uses Hot Index based on the access frequency of fingerprints to improve the deduplication ratio within a single node. With the adaption of Hot Index, when newly coming superblock was not dedupliciated in the similar containers, we can turn to the Hot Index for a second deduplication. In this cache, we set the frequency of the fingerprint in the container when match the fingerprint in the cache, update the Hot Index. 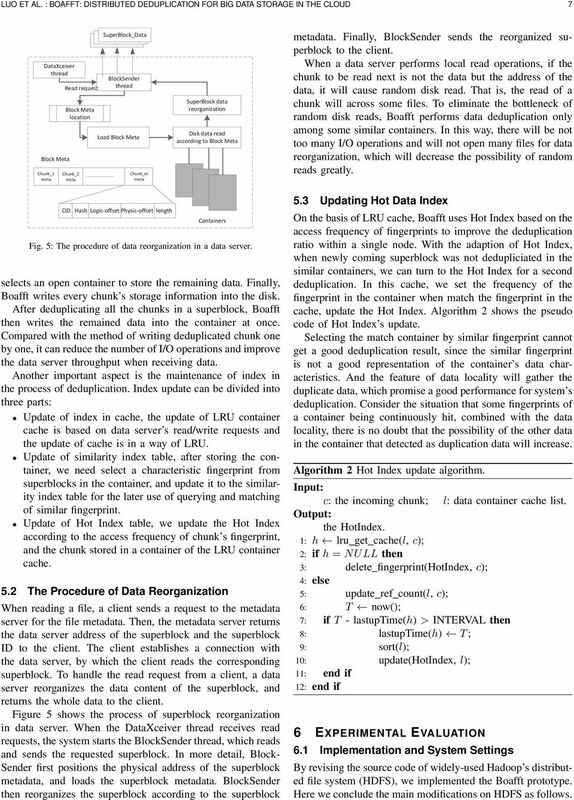 Algorithm 2 shows the pseudo code of Hot Index s update. Selecting the match container by similar fingerprint cannot get a good deduplication result, since the similar fingerprint is not a good representation of the container s data characteristics. And the feature of data locality will gather the duplicate data, which promise a good performance for system s deduplication. Consider the situation that some fingerprints of a container being continuously hit, combined with the data locality, there is no doubt that the possibility of the other data in the container that detected as duplication data will increase. Algorithm 2 Hot Index update algorithm. Input: c: the incoming chunk; l: data container cache list. Output: the HotIndex. 1: h lru get cache(l, c); 2: if h = NULL then 3: delete fingerprint(hotindex, c); 4: else : update ref count(l, c); 6: T now(); 7: if T - lastuptime(h) > INTERVAL then 8: lastuptime(h) T ; 9: sort(l); : update(hotindex, l); 11: end if 12: end if 6 EXPERIMENTAL EVALUATION 6.1 Implementation and System Settings By revising the source code of widely-used Hadoop s distributed file system (HDFS), we implemented the prototype. Here we conclude the main modifications on HDFS as follows. 13 LUO ET AL. 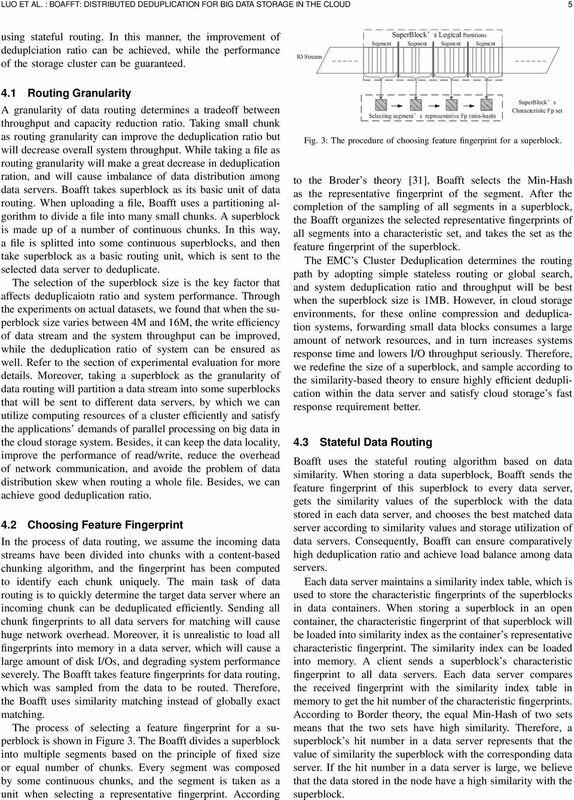 : BOAFFT: DISTRIBUTED DEDUPLICATION FOR BIG DATA STORAGE IN THE CLOUD  Frey D, Kermarrec, A-M, Kloudas, K. Probabilistic Deduplication for Cluster-based Storage Systems[C] Proceedings of the Third ACM Symposium on Cloud Computing. 212: 17:1 17:14. 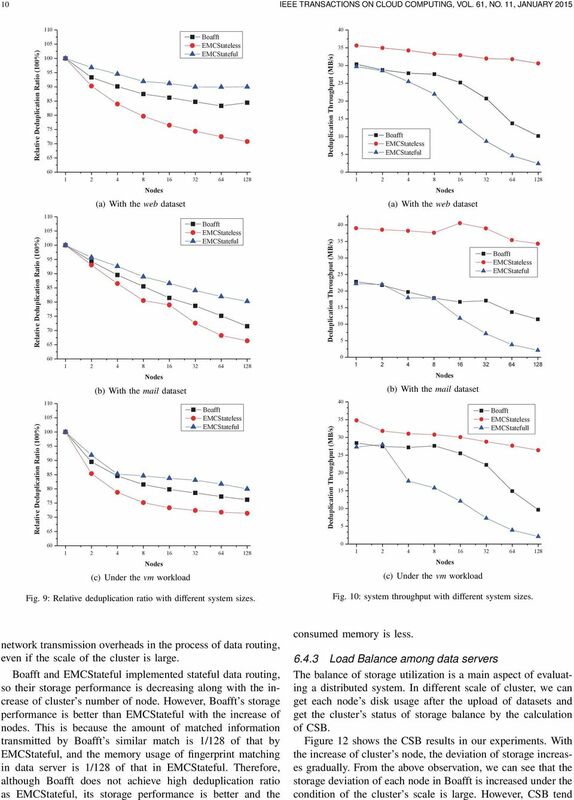 Xia W, Jiang, H, Feng D, Hua Y. SiLo: A Similarity-locality Based Near-exact Deduplication Scheme with Low RAM Overhead and High Throughput[C] ATC  Fu Y, Jiang H, Xiao, N. A Scalable Inline Cluster Deduplication Framework for Big Protection[C] Proceedings of the 13th International Middleware Conference. 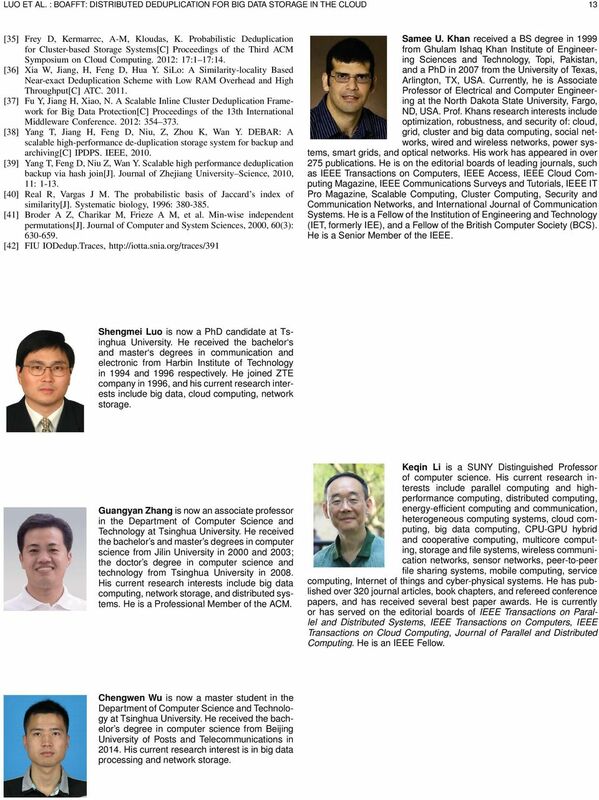 212:  Yang T, Jiang H, Feng D, Niu, Z, Zhou K, Wan Y. DEBAR: A scalable high-performance de-duplication storage system for backup and archiving[c] IPDPS. IEEE, 2. 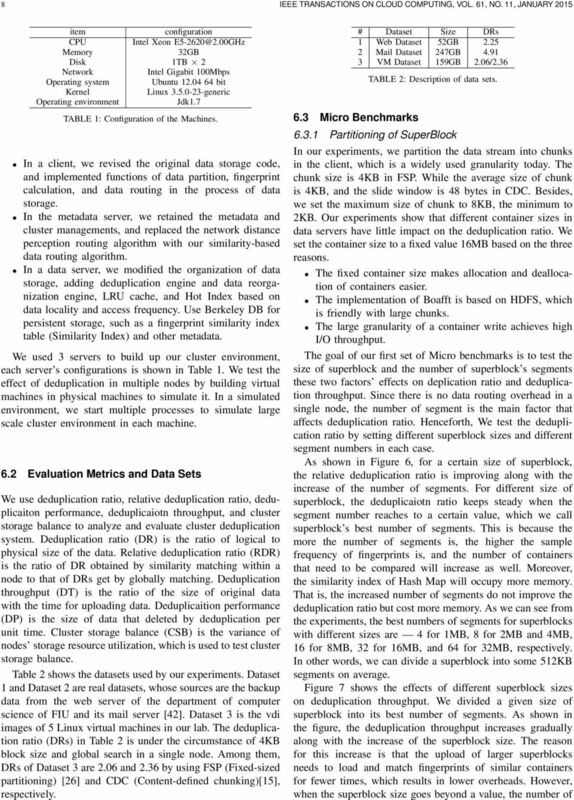 Yang T, Feng D, Niu Z, Wan Y. Scalable high performance deduplication backup via hash join[j]. 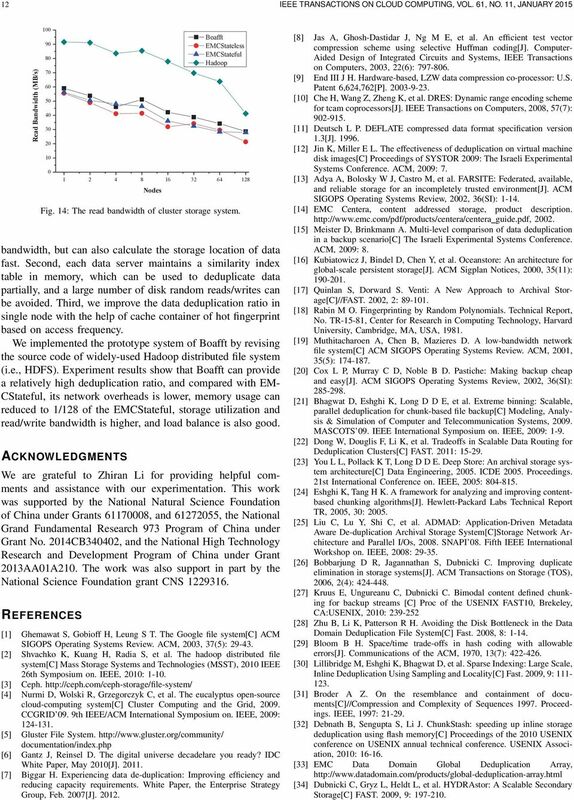 Journal of Zhejiang University Science, 2, 11:  Real R, Vargas J M. The probabilistic basis of Jaccard s index of similarity[j]. Systematic biology, 1996:  Broder A Z, Charikar M, Frieze A M, et al. 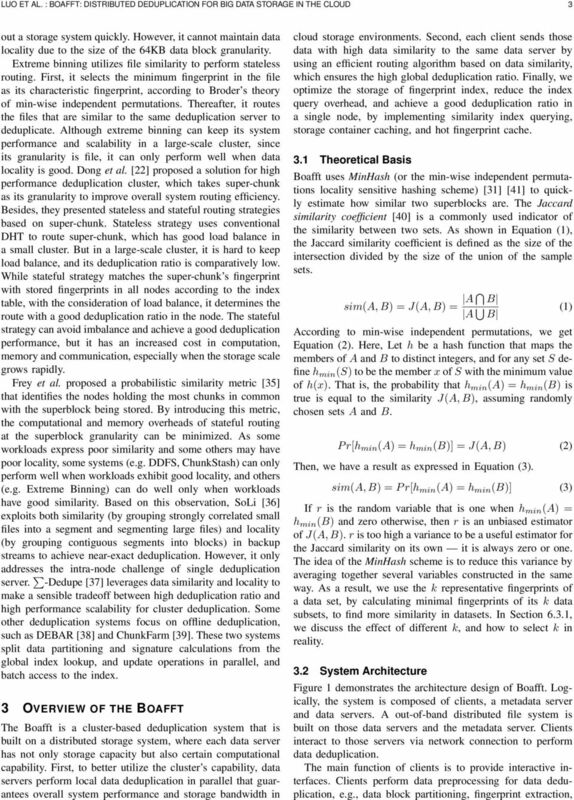 Min-wise independent permutations[j]. Journal of Computer and System Sciences, 2, 6(3):  FIU IODedup.Traces, 13 Samee U. Khan received a BS degree in 1999 from Ghulam Ishaq Khan Institute of Engineering Sciences and Technology, Topi, Pakistan, and a PhD in 27 from the University of Texas, Arlington, TX, USA. Currently, he is Associate Professor of Electrical and Computer Engineering at the North Dakota State University, Fargo, ND, USA. Prof. Khans research interests include optimization, robustness, and security of: cloud, grid, cluster and big data computing, social networks, wired and wireless networks, power systems, smart grids, and optical networks. His work has appeared in over 27 publications. He is on the editorial boards of leading journals, such as IEEE Transactions on Computers, IEEE Access, IEEE Cloud Computing Magazine, IEEE Communications Surveys and Tutorials, IEEE IT Pro Magazine, Scalable Computing, Cluster Computing, Security and Communication Networks, and International Journal of Communication Systems. He is a Fellow of the Institution of Engineering and Technology (IET, formerly IEE), and a Fellow of the British Computer Society (BCS). He is a Senior Member of the IEEE. Shengmei Luo is now a PhD candidate at Tsinghua University. He received the bachelor s and master s degrees in communication and electronic from Harbin Institute of Technology in 1994 and 1996 respectively. He joined ZTE company in 1996, and his current research interests include big data, cloud computing, network storage. Guangyan Zhang is now an associate professor in the Department of Computer Science and Technology at Tsinghua University. He received the bachelor s and master s degrees in computer science from Jilin University in 2 and 23; the doctor s degree in computer science and technology from Tsinghua University in 28. His current research interests include big data computing, network storage, and distributed systems. He is a Professional Member of the ACM. Chengwen Wu is now a master student in the Department of Computer Science and Technology at Tsinghua University. He received the bachelor s degree in computer science from Beijing University of Posts and Telecommunications in 214. His current research interest is in big data processing and network storage. Keqin Li is a SUNY Distinguished Professor of computer science. His current research interests include parallel computing and highperformance computing, distributed computing, energy-efficient computing and communication, heterogeneous computing systems, cloud computing, big data computing, CPU-GPU hybrid and cooperative computing, multicore computing, storage and file systems, wireless communication networks, sensor networks, peer-to-peer file sharing systems, mobile computing, service computing, Internet of things and cyber-physical systems. He has published over 32 journal articles, book chapters, and refereed conference papers, and has received several best paper awards. He is currently or has served on the editorial boards of IEEE Transactions on Parallel and Distributed Systems, IEEE Transactions on Computers, IEEE Transactions on Cloud Computing, Journal of Parallel and Distributed Computing. He is an IEEE Fellow. 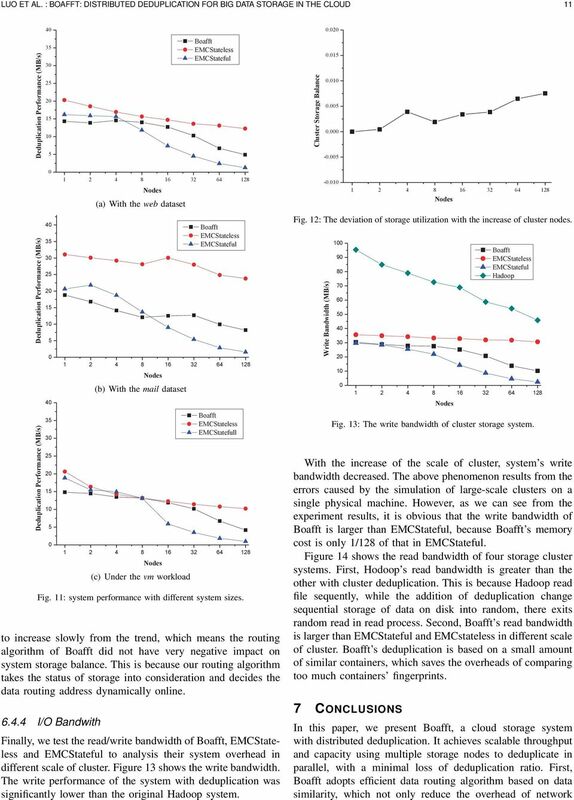 A Novel Deduplication Avoiding Chunk Index in RAM 1 Zhike Zhang, 2 Zejun Jiang, 3 Xiaobin Cai, 4 Chengzhang Peng 1, First Author Northwestern Polytehnical University, 127 Youyixilu, Xi an, Shaanxi, P.R.